It’s a contest! We have two speakers now, one each from Monte Vista and Mitty. The club level contest will be held in mid-February (date to be confirmed). The church had to change the date of our breakfast. The club’s Annual Pancake Breakfast will now be held on Sunday, April 15, 2018. Tickets and more to come soon. We had a good turnout for this meeting. Back from his summer hideout in Canada was Lion Ward Eister. Lion Larry Edson was also in attendance, and future Lion Hobee made his second of three visits (he also helped work the beer booth at Oktoberfest this past weekend). Save the Date: Lion Bert Caro let us know that the club’s Holiday Party is tentatively set for Wednesday, December 13 at 6:30pm, at Aldo’s. Campbell’s volunteer appreciation dinner takes place Nov. 1 at Nordahl Hall, 580 W. Parr Ave. in Los Gatos. It is a free event in appreciation for all of those individuals (including our club members) who volunteered over the past year at events and activities like Oktoberfest. If you are going to attend, register with the Campbell Chamber of Commerce so that they can order enough food. The Lions Eye Foundation’s latest newsletter mentions our club for donating $1,000 last year. Note that most of our donations last year were higher than usual because of a surplus of unspent money in the charity fund, left over from the previous 3 years. The club received a thank you from Stop Hunger Now for our donation to help them purchase food for distribution. They will need volunteers to help pack the food on November 2nd. Contact Lion Pres. Judy if you are interested in helping. We continue to collect pill bottles (labels removed), plastic bottle caps, and cell phones—along with our traditional used eyeglass collection. If you have any of these items, bring them to a meeting. White Cane Days a Success! We collected for White Cane Days on October 6 & 7. This year’s budget had a goal of collecting $1,000. As of the meeting on Tuesday, 10/10, Lion Ed Pansullo reported that we had collected a total of $1,481.93. Thank you to everyone who turned out to collect money, and to all of those who donated. Several pairs of glasses were donated both days as well. We will also accept donations of your used eyeglasses at both locations. We have two special programs to start the month of October, and we would like all club members, former members, friends, and others to attend (and bring a guest if you can). Tuesday, October 10: Special guest and new US Citizen, Lion Henrik S., in town for another visit to our club and a discussion of US Immigration and Citizenship. We always like to have good attendance for our speakers, and we enjoy seeing you at a meeting. Please join us if you can. White Cane Days (10/6 & 10/7): Last Tuesday, the sign-up list still had some blanks to be filled in. Please contact Lion Ed Pansullo at 408-378-7327 if you can help. Oktoberfest (10/21 & 10/22): There were still a few slots open, mostly on Sunday afternoon. Contact Lion Art Low at 408-839-5495 if you are ready to have some fun working alongside your fellow Lions. There’s another way to help with White Cane Days! For the first time, we are trying out taking White Cane donations online (credit and debit cards only). We are asking you to send a note to your Facebook friends, or an email or anything to anyone else you know, inviting them to visit https://wsjclionswhitecane.eventbrite.com and make a donation to the club. There is more information about the club and White Cane Days on that page that you can copy and use in your note. The page will be available to take donations now through October 10. Our website (wsjclions.org) will be changing soon. This will mainly affect the “front”, or “landing” page. When it changes, the new front page will be a static page with general information about our club. The first page you have seen in the past, with the latest news and the club calendar, will still be accessible under a [News] button on the menu. If you bookmark the News page after the change is complete, then for you it will seem like nothing has changed. A “permanent” Google voice # (free), currently forwards calls to Roald Alexander, Ed Pansullo. Public email address. The older address, info (at) wsjclions (dot) org, also works. The club’s website, with club information, an event calendar, and more. Site being tried for taking online donations, selling event tickets, making dues payments. It accepts credit and debit cards. Our club’s e-clubhouse web page, from Lions International. 1st VP Roald Alexander was in charge this week, with Lion Pres. Judy and Lion Sec. Jan both away on vacation. They are expected to return on the 29th. What started out to be a quiet meeting became quite busy. Lion Art Low and Ed Pansullo will be gone the first full week of September, participating in the Lions in Sight Panama Mission. They will have a presentation on the trip at our September 12 meeting. Oktoberfest is less than two months away, on October 21 & 22. Lion Art says he will start the signup sheet at next week’s meeting. There will be morning and afternoon shifts on both days. The ABC training, for anyone who needs it, will be held on Sunday Oct 1. Registration required. Members are encouraged to wear their purple Lions polo shirt while working their shift. New Lions shirts with the Lions logo are available from the Lions Store for around $40 + S&H. An even better deal, you can order one through Lion Bert Caro — customized with the club’s name — for $28, payable on delivery. [Breaking News!] There is a supply hiccup. After last year, we threw away the old, torn, stained, and faded signs, planning to replace them this year. 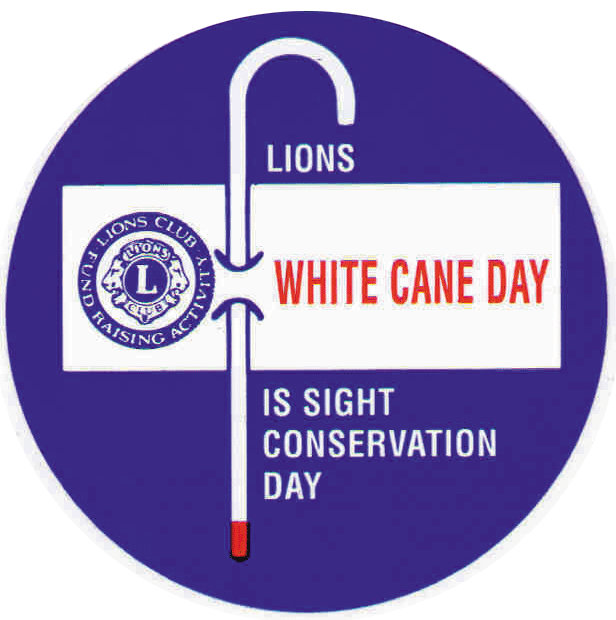 Our supplier of canes and signs — White Cane Day Inc. — a project affiliated with the Monterey Park Lions Club, has shut down. The equipment and materials were passed on to the Washtucna (WA) Lions Club. They don’t appear to be in business yet. We do have other options to replace the signs and canes for this year’s White Cane Days. In place of additional white canes, we can order White Cane Day stickers (kind of like “I Voted” stickers) from Lions International for $23 per 1000 stickers. Lion Roald is working on creating a poster that we can get printed, probably locally. Lion Bert Caro has offered to pay for the posters. Once the posters are printed, we will need a small work party to help glue them onto all of the sign boards (around 7 or 8 signs). Our White Cane Day Chairperson, Ed Pansullo, was not at the meeting and didn’t have this information yet. Our two, school related contests are both approaching as well. We have lost most of our school contacts. If you have any contact information for Middle Schools (Peace Poster contest) or High Schools (Speaker Contest), please let the project chairs know. We came up with a few possibilities in the meeting, but we definitely need more. Lion President Judy reminded everyone that there will NOT be a Board Meeting in August. This is due, in part, to vacations. The next Board Meeting will be Thursday, Sept. 28th, at 6:30pm. Bring your bottles to our Tuesday meetings, where we will collect them. Lion Linda will gather them for shipment to Matthew 25: Ministries, which packs the bottles along with shipments of medicine being sent to countries in need. Our newest member has been voted into the club. Lion Linda’s husband is now Lion Dave Logan. Although he has been voted into the club, we are waiting with his formal induction to allow the District Governor to induct him. The DG’s visitation is being rescheduled for a date hopefully in September.